The Good Fork, founded by Chef Mary Wills, specializes in catering private events with simple, sustainable dishes inspired from her extensive training in Northern Italy. The Good Fork works with regional farmers and all menus are customized creatively to the season and the event. Simple. When was the last time you tasted and experienced a ripe tomato? Sounds amateur, right? 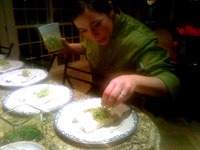 Chef Mary believes that eating local food, fresh picked is a pleasure inducing experience. Harvested as close to your event as possible and handled as little as possible is how we keep the integrity in our preparations. Five ingredients per plate is the way in which we go about dreaming up a dish - anything more than that is too confusing and the aromas start to become lost. We let the food stand on its own and the flavors play together on your plate. Sustainable. We recognize the importance of knowing where our food comes from, supporting our local farmers, and bringing attention to the positive impact it has on our environment and local economy. Green. Green is the new organic, and it's never been easier to green our events effortlessly in Northeast Ohio. From our natural table decorations, to our reusable or biodegradable tableware, we minimize our carbon footprint as much as possible! Chef Mary Wills is an arsenal of creative ideas, throughout our site you will find just a few listed themed events, but please contact us at hello@thegoodfork.net to inquire about how we can custom-tailor a sustainable menu and themed event just for you!